Hence, some have viewed the GST as a more equitable means of collecting revenue for the government as it matches the tax with the ability to pay. A number of countries including Singapore, Thailand and Australia, have already adopted a similar type of indirect tax. The mechanics of GST are similar to the value added tax in the UK and Europe, so this tax although new to Malaysia has an established place on the world tax scene. Conceptually, GST is imposed on the value added to goods or services by each separate processor in the production and distribution chain. The value added is the value that a producer (whether a manufacturer or distributor, etc) adds to its raw materials or purchases before selling the new or improved product or service. Upon selling the product or service, the manufacturer or distributor will include a charge for GST at the relevant rate on the value of the supply made. The manufacturer or distributor will pay the GST collected on its sales (also known as output tax), to the Royal Malaysian Customs, but after deducting the GST it suffered on its purchases (also known as the input tax). And the cycle goes on. Hence, in reality, GST is a multi-stage tax on the increase in the sales price of the goods or services as they pass through the chain. The consumer ultimately bears the burden of the tax. This can be seen in the simple illustration chart (right). In order for a taxpayer to impose GST, the taxpayer must be registered with the Royal Malaysian Customs. There will generally be a minimum threshold (e.g. based on turnover) before a taxpayer is required to charge GST. The registered taxpayer would be required to submit periodic GST returns. If the output tax is greater than the input tax, the taxpayer will have to pay the excess. Conversely, if the input tax is greater than the output tax, the taxpayer could seek a refund from the Royal Malaysian Customs. It is envisaged that not all goods and services will be subject to GST. In the UK for example, there are four types of supply for GST, namely standard rate (15 per cent), zero rate (0 per cent), exempt supplies as well as the reduced rate (5 per cent). It is important to know what category the supplies fall in. This is because where a registered taxpayer is supplying standard rated or zero-rated supplies, the registered taxpayer will be able to claim an offset for input tax suffered on supplies it acquired. However, if the registered taxpayer’s supplies are exempted, the taxpayer will not get a refund on the input tax suffered. Similarly, the taxpayer’s customer will not have any input tax to set off against its output tax. This may be an important factor in determining the business competitiveness of the taxpayer. What can be expected next is the release of the GST Bill. However, as GST is industry-based, there would be accompanying Regulations to implement the system effectively and these regulations are likely to be quite extensive. It would be interesting to see the various rates of GST and the extent of the taxable supplies. And as everybody will be affected, it is important to understand not only how the system works but what actions need to be taken in the run up to GST. Running through the checklist below could be a good starting point. 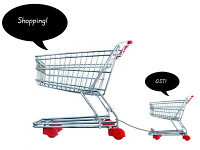 Clearly, preparation for the implementation of GST is essential for businesses and at the same time understanding the implications of GST on consumption is vital for consumers.